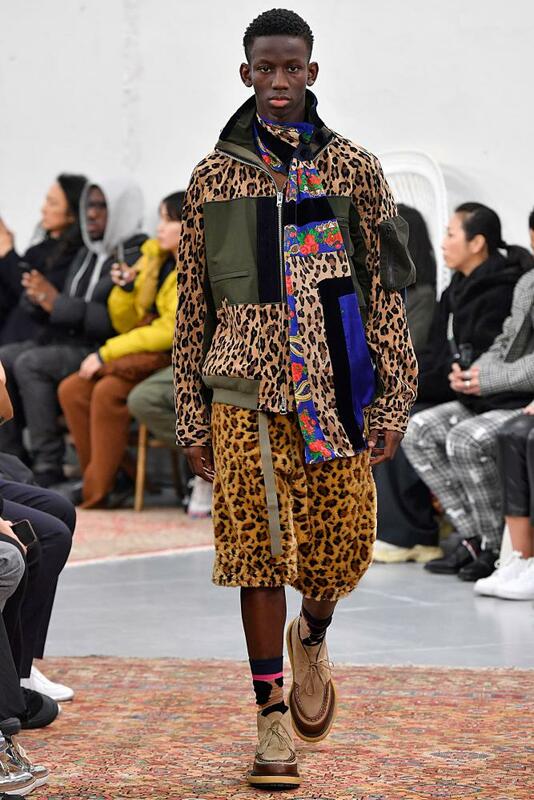 The autumn/winter 2019 menswear shows were full of comebacks and firsts. Milan hosted blockbuster shows from Prada, Versace and even Dolce & Gabbana, treading carefully after last year’s China racism row. 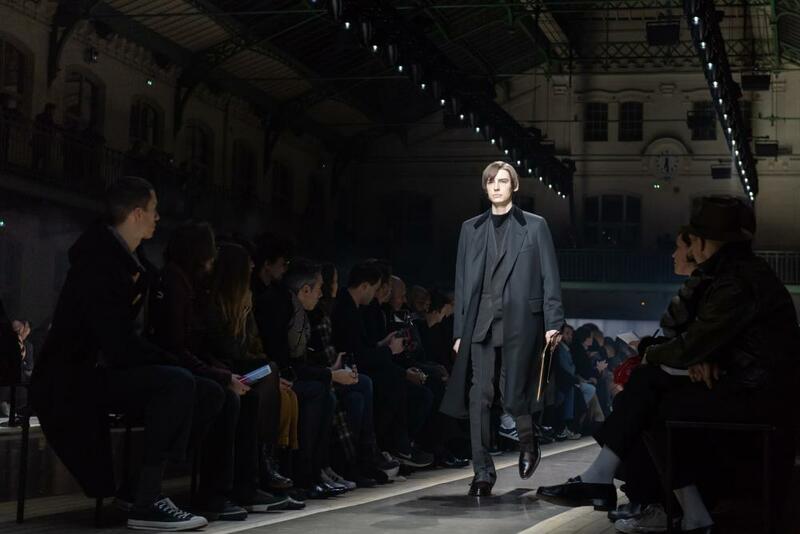 Paris was packed and cold, but saw universally successful debuts from Hedi Slimane at Celine, Jonathan Anderson at Loewe and Clare Waight Keller at Givenchy. 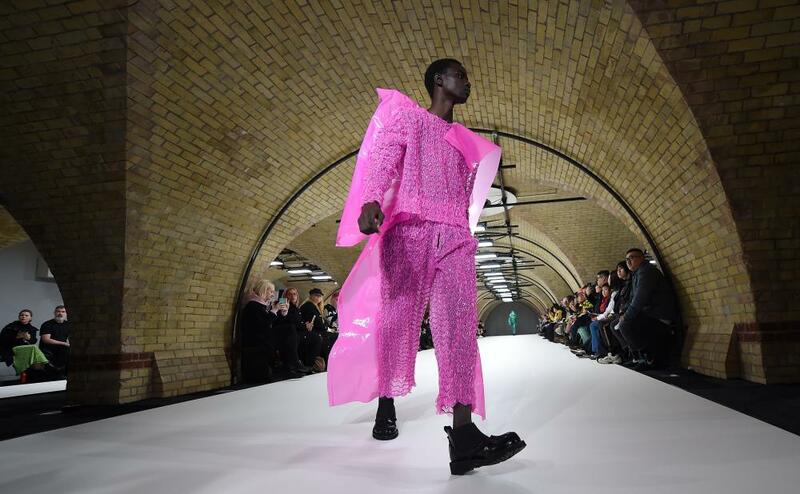 Craig Green returned to the London schedule alongside Charles Jeffrey Loverboy, who had a plaid party in a warehouse, and A-Cold-Wall*, which put a doberman on the catwalk. Scarves were long, bags were big and for the first time in four seasons, tailoring triumphed over tracksuits. Here are the other trends we can expect to see next autumn. 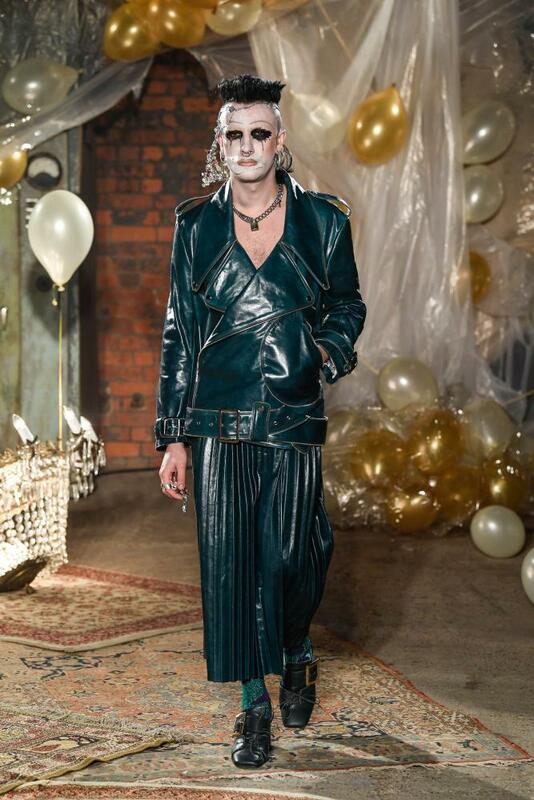 John Lawrence Sullivan show during London fashion week at Kachette. 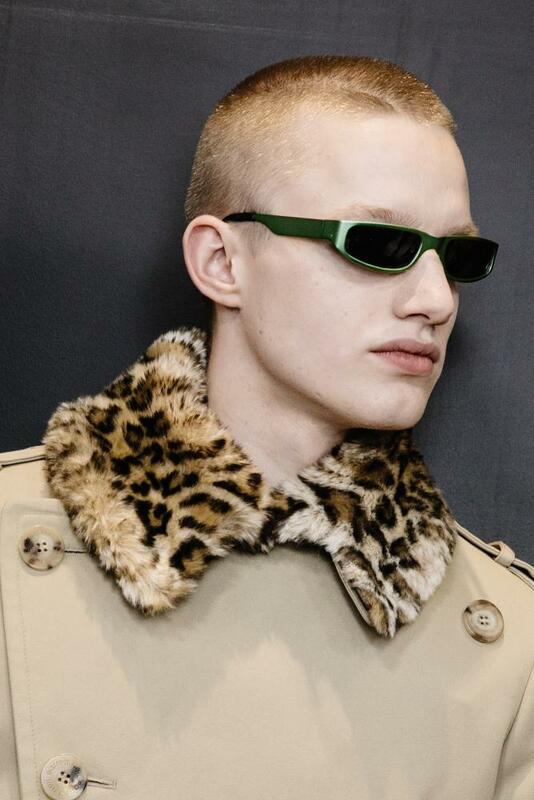 Rare is the season in which leopard print is absent from womenswear … but menswear? It’s hardly a perennial. Yet this season it was, appearing in all shades and motifs, brash and textured. At John Lawrence Sullivan, it appeared on coats and bomber jackets in clear 70s prints. 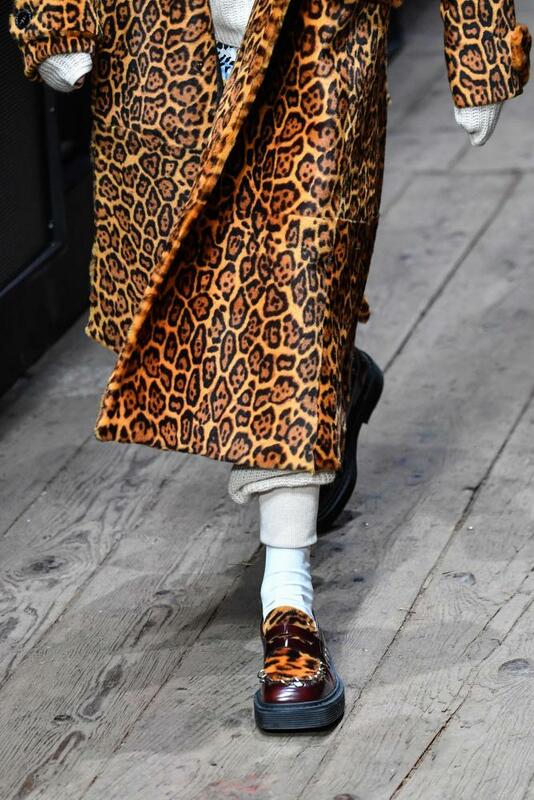 At Marni, it ran the gamut – from creepers and fluffy coats, to hats and wide-legged trousers, lending the whole collection a cartoonish edge. 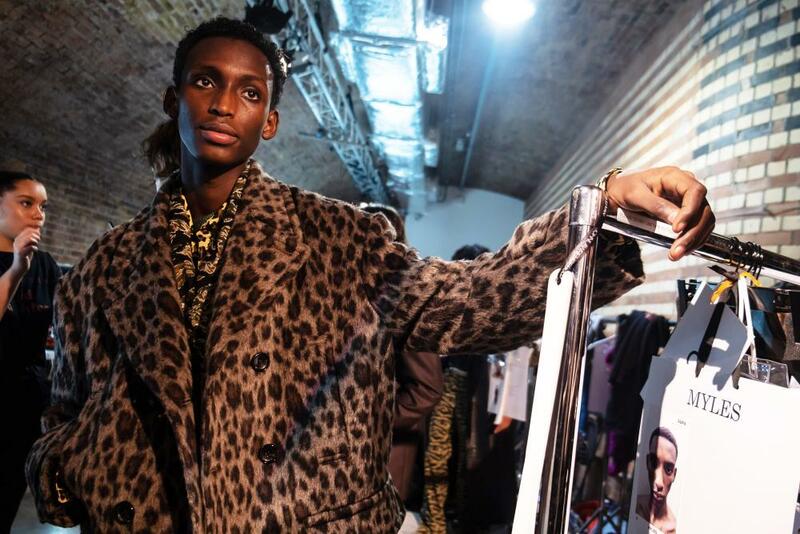 Neil Barrett put it on collars and Sacai doubled it up, but few expected to see a mod-style leopard-print coat in a quiet shade of gold. Some labels can change their spots, it seems. Take a walk on the wild side: Marni, Sacai, Neil Barrett and Céline. 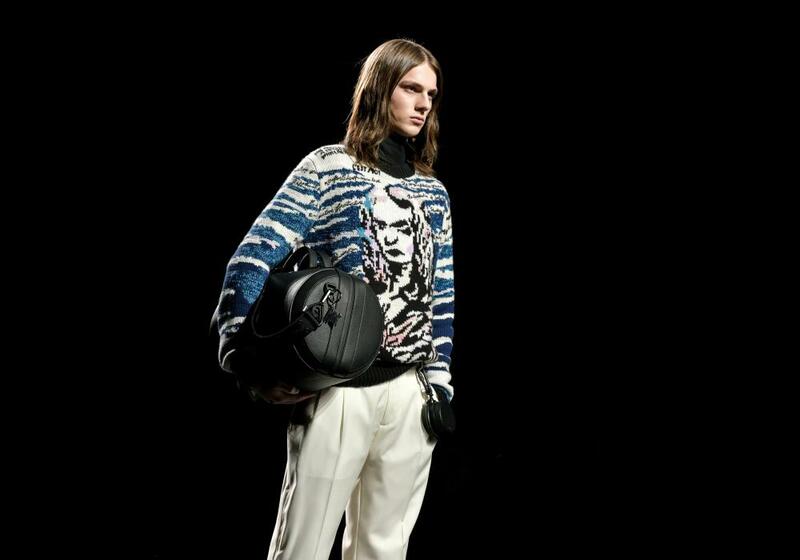 This season, the death knell rang out for sportswear. Well, not quite, but the suit gave it a run for its money. Black versions that were edgy and funereal at the same time led the charge. In Paris, they were elegant, crisp and flowing at Dries van Noten, relaxed and casual at Valentino, and serious and winter-proof at Dunhill. At Dior, they came red-carpet ready with a detachable sash. 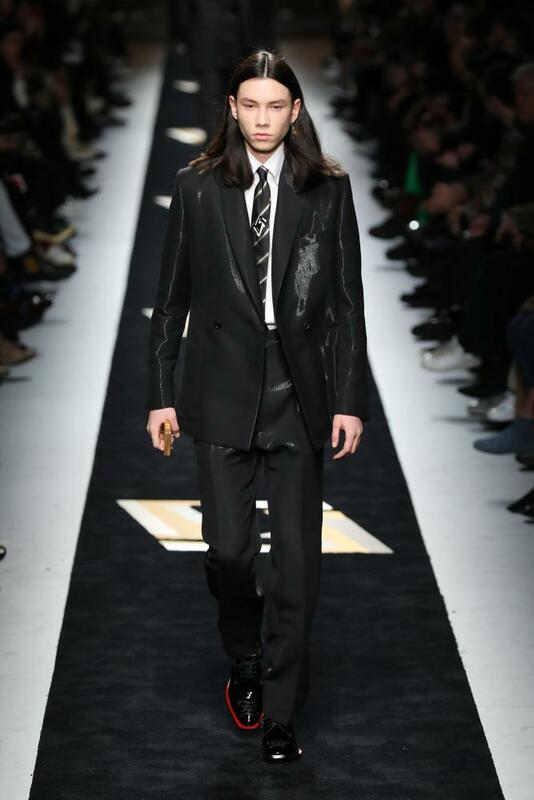 Men in black: Stella McCartney and Prada. Over in Milan, Prada and Fendi showed versions with a high-octane glamour and feminine undertone – think shine and a slim cut that was pleasing to watch on the catwalk. Stella McCartney went for a back-to-school version. 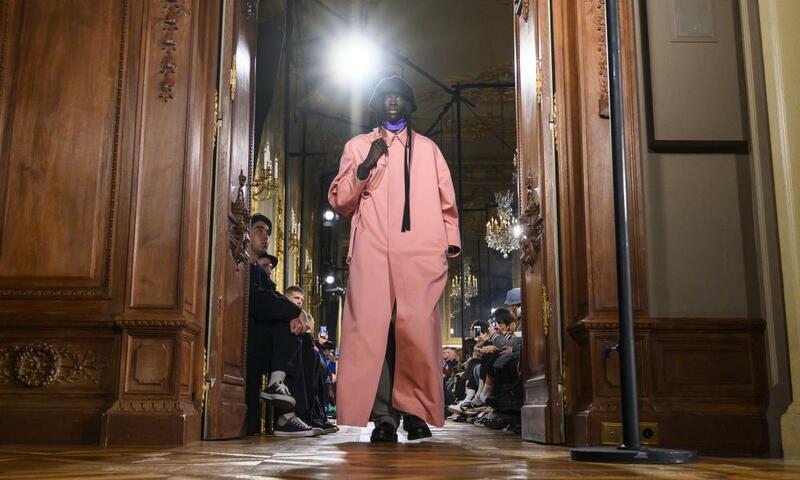 At Berluti, Kris Van Assche closed the show with a his-and-hers version – because how many trends overlap genders quite so keenly? Black is back: Fendi and Valentino. 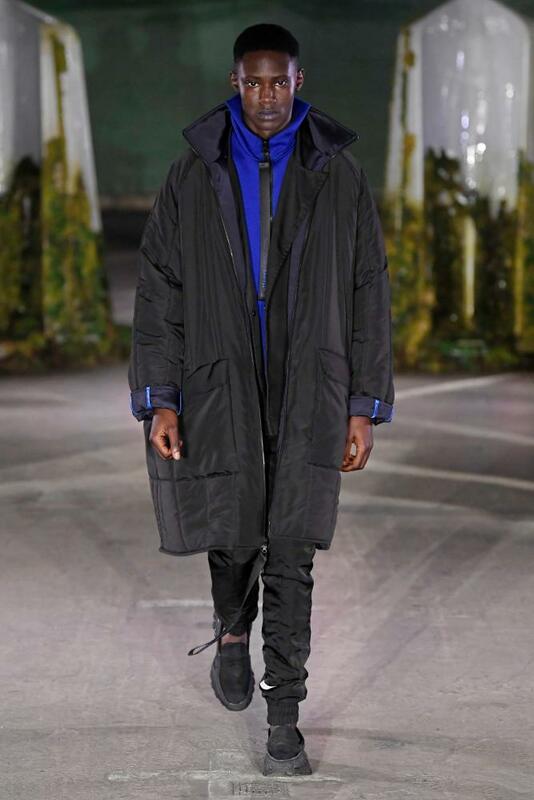 Craig Green during London fashion week men. The autumn catwalks were a riot of colour this season, yet one shade ruled them all. 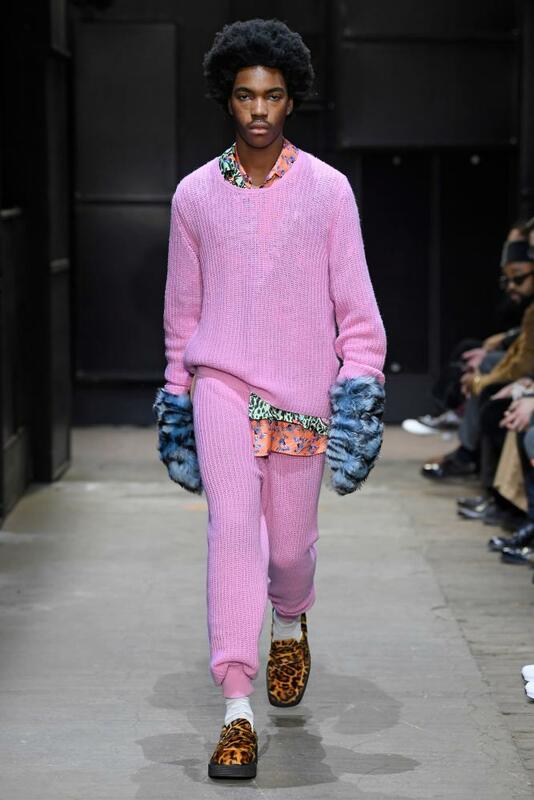 Surprisingly, for a world that has been saturated by millennial pink and all the cultural and gender baggage that comes with it, here it was used with nuance, clashing with green or layered up at Ami and Acne Studios (the same Acne Studios that put it on a bag and launched a thousand copycats). 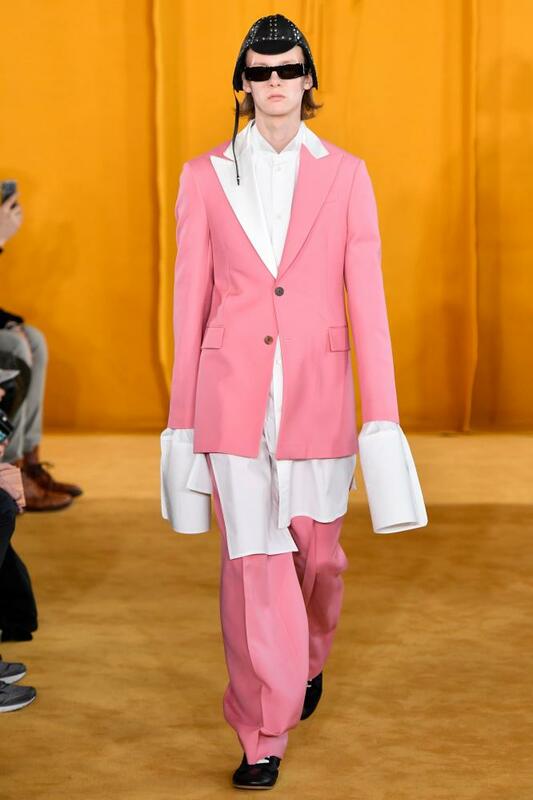 At Loewe, Anderson turned it into a suit over comically oversized shirting, a fun combination which clashed magically with the mustard carpet. Craig Green and Marni went for head to toe, playing with textures and fabrics – high shine or knitted, this was a “choose your weapon” moment. 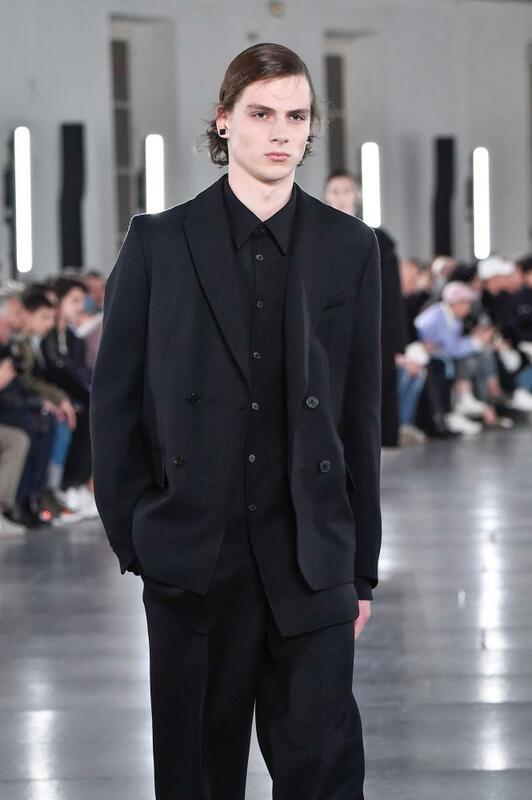 At Raf Simons, in his first show since news of his departure from Calvin Klein, the takeaway moment was a voluminous pink trenchcoat – no belt – styled in a loose, carefree way. “I want to do something abstract and beautiful and elegant and proud and sophisticated, but without losing the edge of what the brand stands for: the young generation,” he told Vogue. Touche. 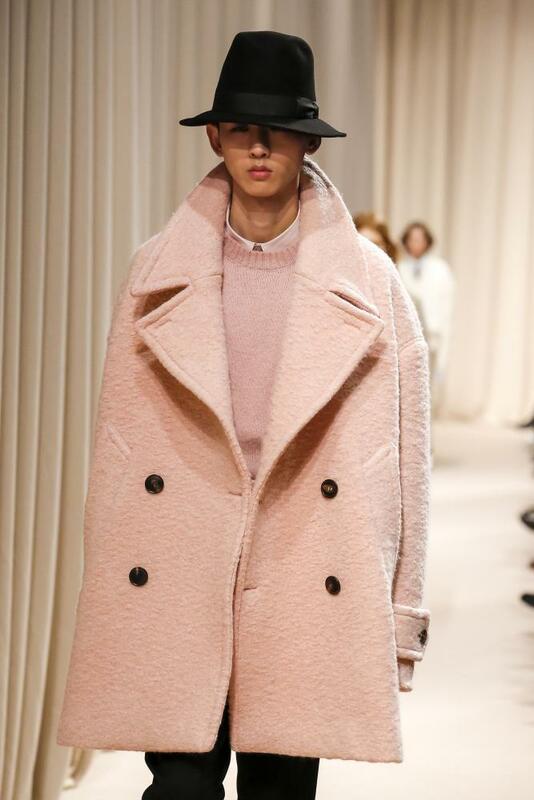 Pink overcoat at Raf Simons show in Paris. Everything’s rosy: Ami Paris and Acne Studios. 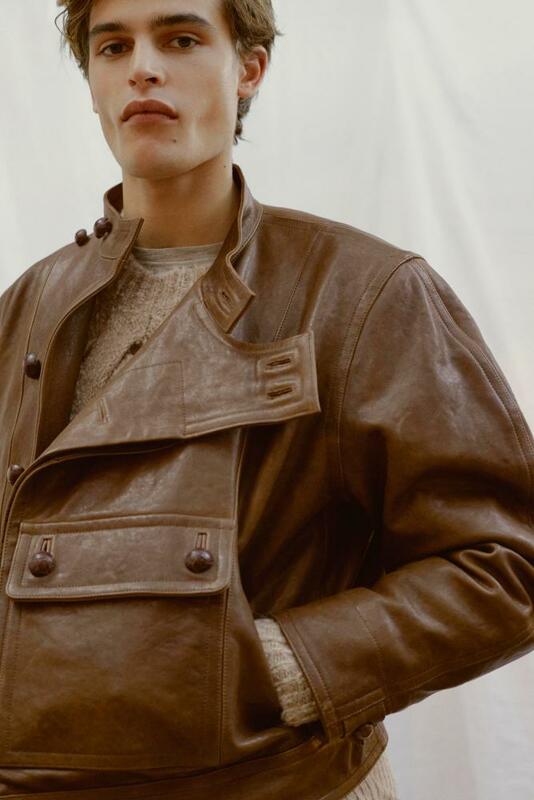 As ever, leather was a recurring theme at the shows this year, though few things will top the Instagram picture of Frank Ocean in a pair of leather Loewe chaps backstage. 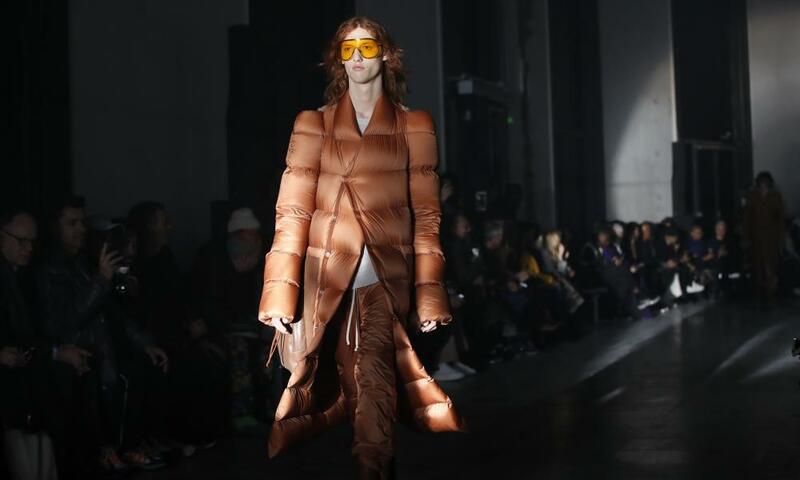 That said, Isabel Marant’s flying jackets with billowing arms were wearable and a tour de force, while Givenchy’s ultra-tight leather trench (belted, this time) was a lesson in elegance. 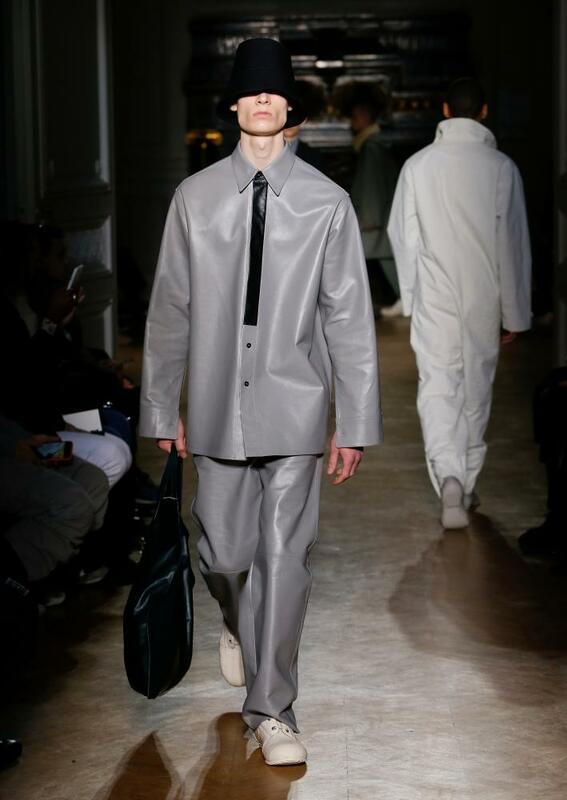 Jil Sander’s loose-fitting, grey leather shirt and leather trouser combination was aimed at the brave. 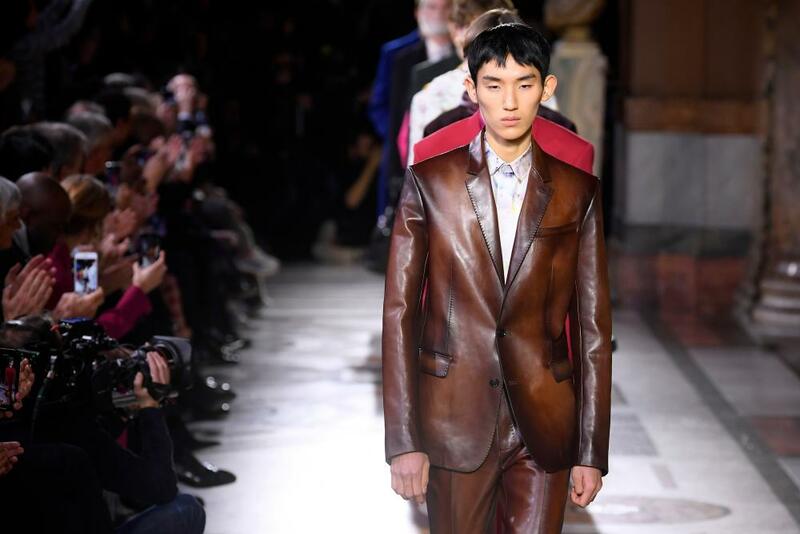 Ditto Charles Jeffrey Loverboy, who went vintage with his jackets, and Berluti which opened the show at the Palais Garnier opera house with a tan brushed leather suit. 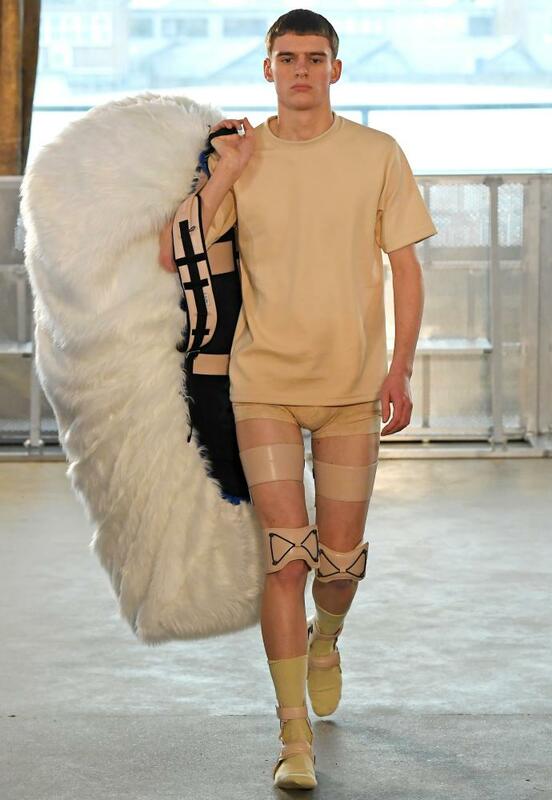 Hell for leather: Isabel Marant, Charles Jeffrey Loverboy, Givenchy and Jil Sander. 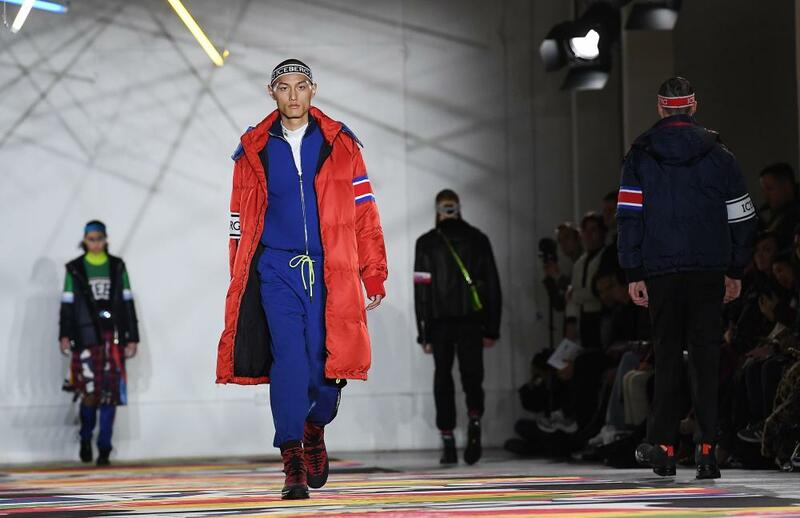 This season, men’s fashion continues to work in tandem with the weather, with puffer jackets designed to withstand the polar vortex. 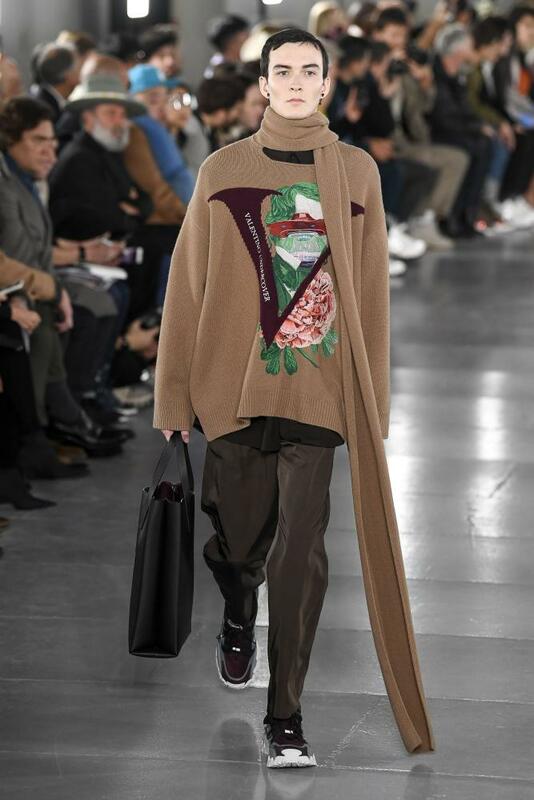 A bona fide trend since Balenciaga put them on the 2017 catwalk, they came athleisure-friendly at Iceberg under James Long in London, patched like a Mondrian at Fendi in Milan or low-denier and commuter-friendly at British label, Cottweiler. 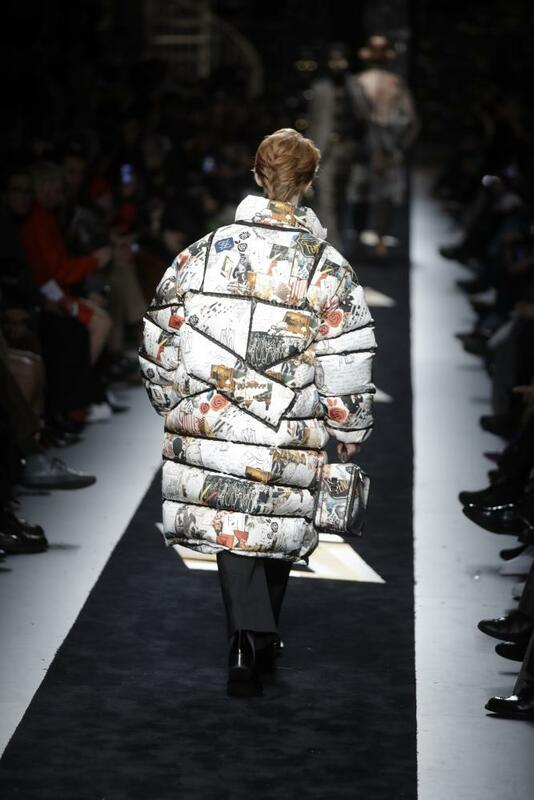 Pump up the volume: Fendi, Cottweiler. 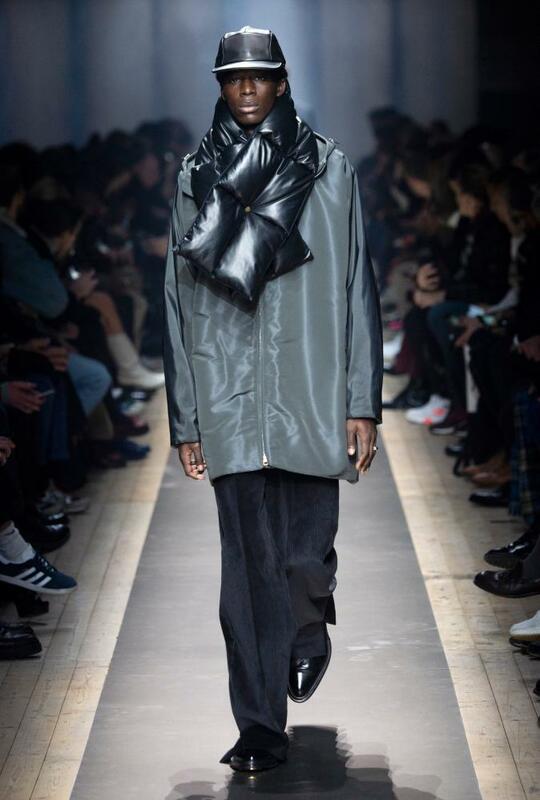 If oversized, primary-coloured puffer jackets have dominated high and low fashion for the past two years, Rick Owens’ longline versions were a u-turn moment, coming fitted in metallic and monochrome shades. 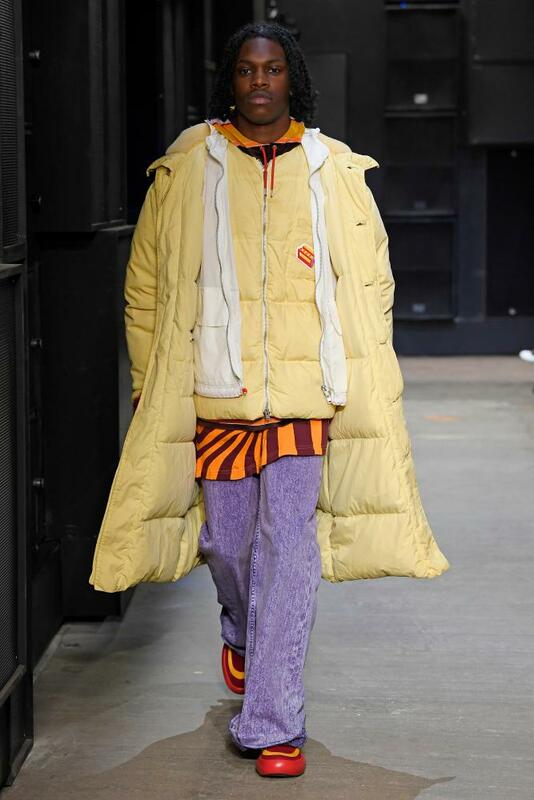 Marni’s Francesco Risso introduced the hybrid coat/robe as outerwear this season, but it was his layered puffers in iced lemon which stole the show. 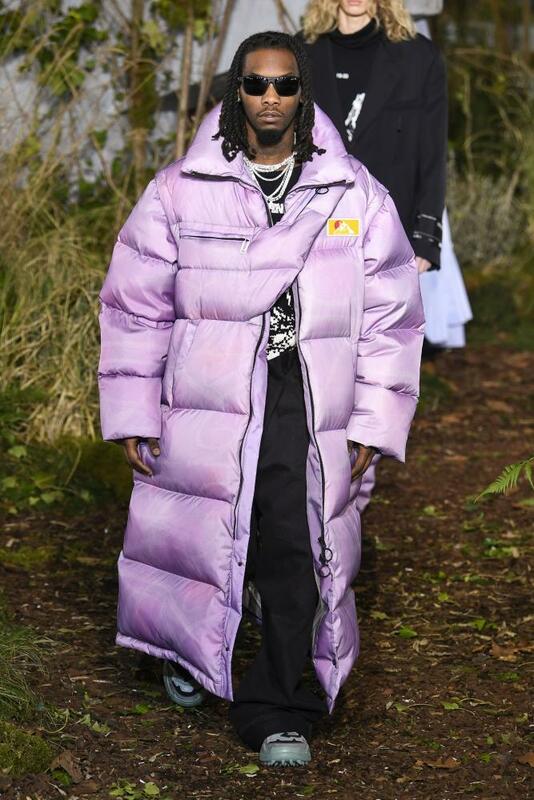 Unless you count Cardi B’s on/off boyfriend, Offset, modelling a duvet coat in lilac with a built-in bumbag worn cross-body on the Off White catwalk, accessorised by the scent of vaping. Puff daddies: Rick Owens, and below: Marni, Off-White. Bags’ shapes wax and wane in fashion. 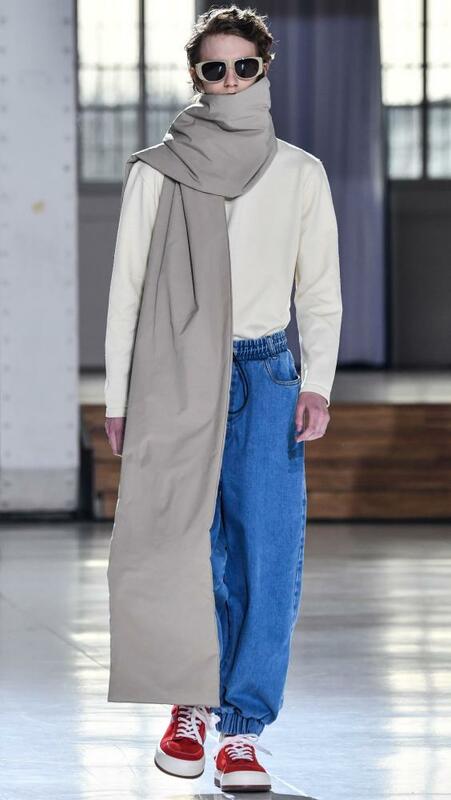 But in menswear this season, they were enormous. 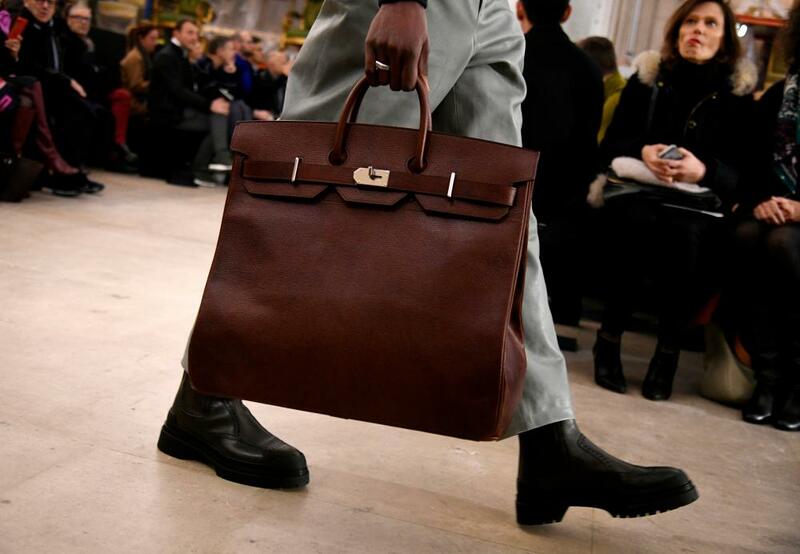 In Paris, Hermès showed a men’s version of its cult Birkin bag in deep red, but elsewhere they tended towards sportier shapes. 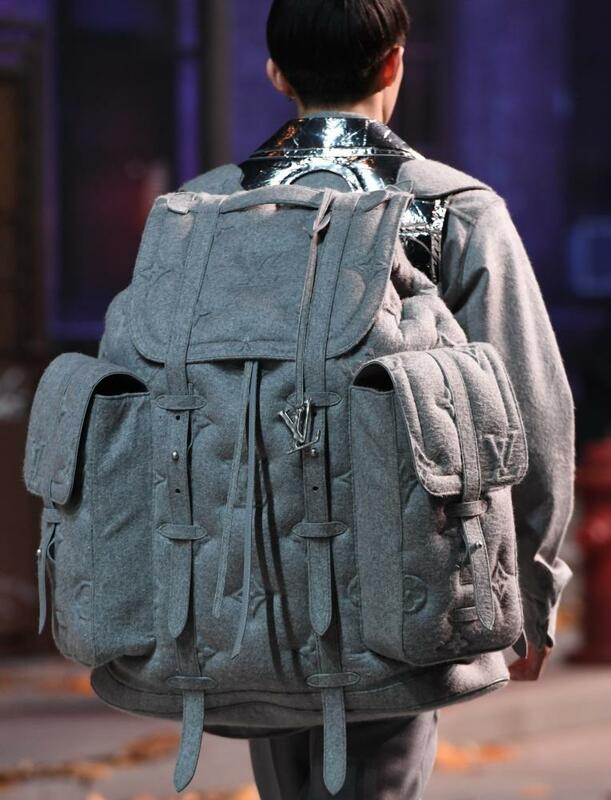 At Louis Vuitton, designer Virgil Abloh created a giant rucksack in grey felt with a subtle monogram, while Loewe created a drawstring bag in pastel leather. 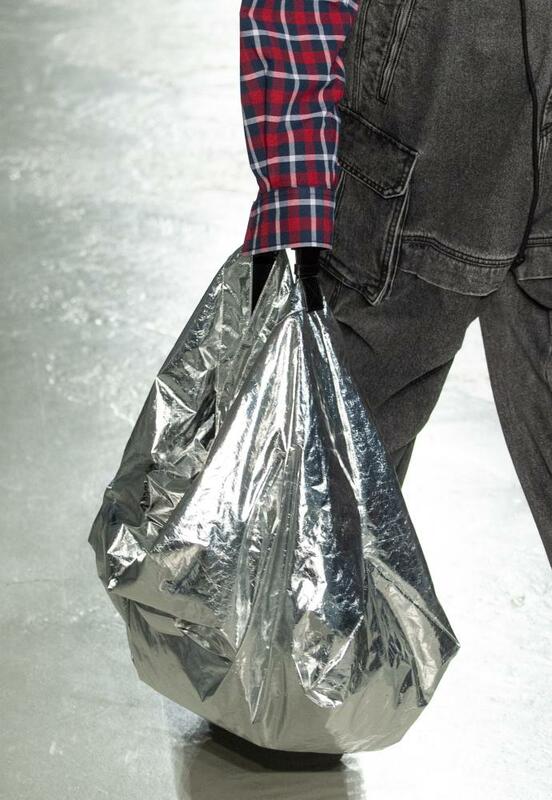 Working with a “survivalist” theme, Korean designer Juun.J created silver foil totes which packed down small – this in stark contrast to Xander Zhou whose huge one shouldered bags resembled angel’s wings. 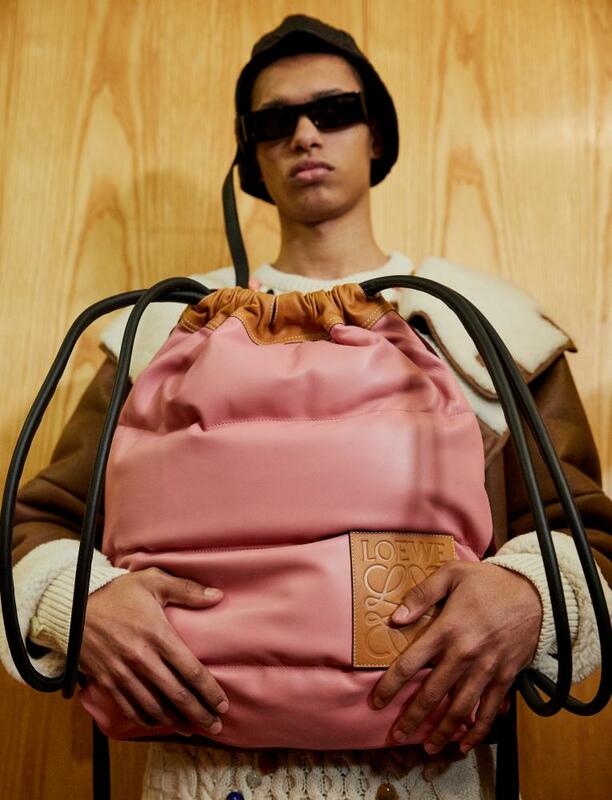 Pink drawstring at Loewe, and rucksack at Louis Vuitton. An oversized take on the Birkin shape at Hermès. 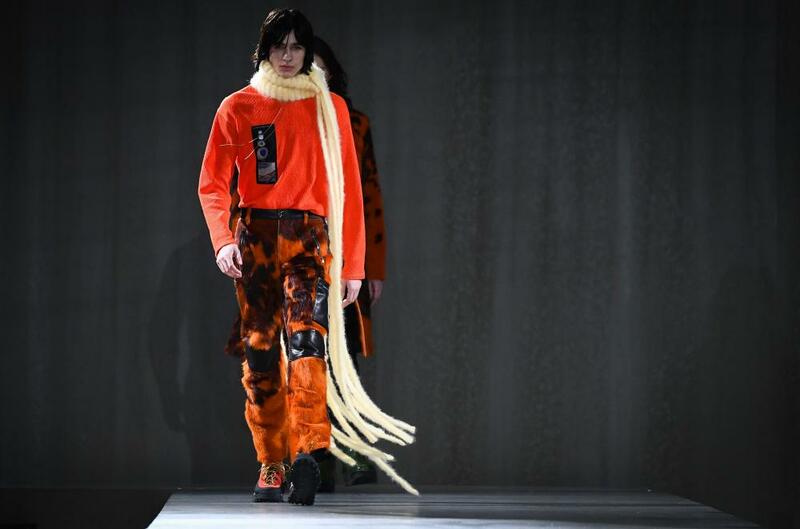 Designers took their cue from Mr Tickle this season with scarves of all textures, shapes and colours trailing down the catwalks. 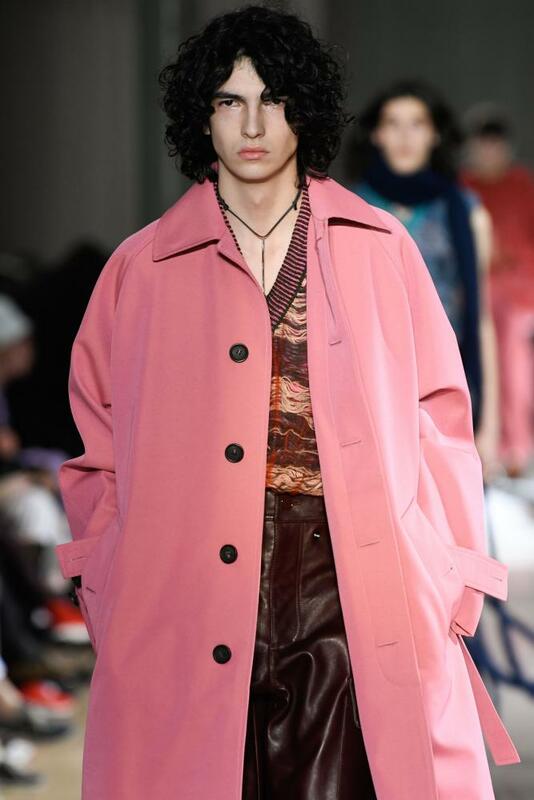 At Acne Studios and Valentino they were floor-length and comically proportioned, either tasselled or fine ribbed and thrown over one shoulder. 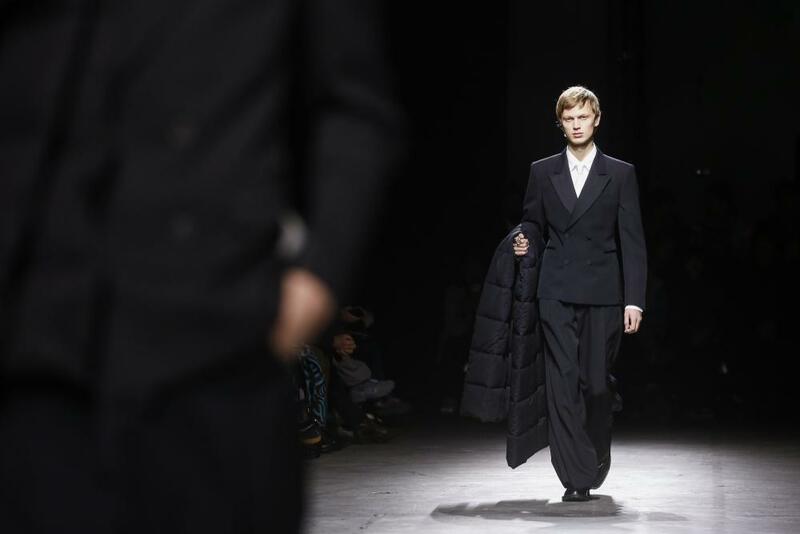 At Sunnei in Milan they came in muted tones with an apres-piste aesthetic, and were as wide as blankets. 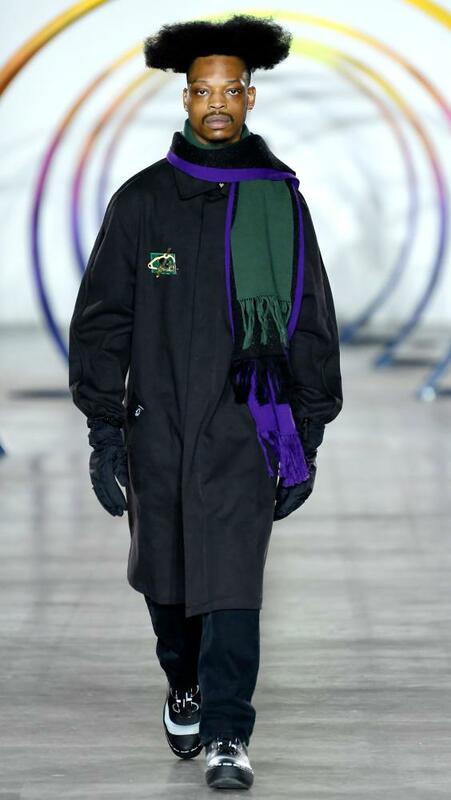 Dunhill designer Mark Weston continued to play with the classically masculine wardrobe; his were short, in a puffer fabric. Sport meets tailoring, perhaps. Knitted scarves at the Valentino show. 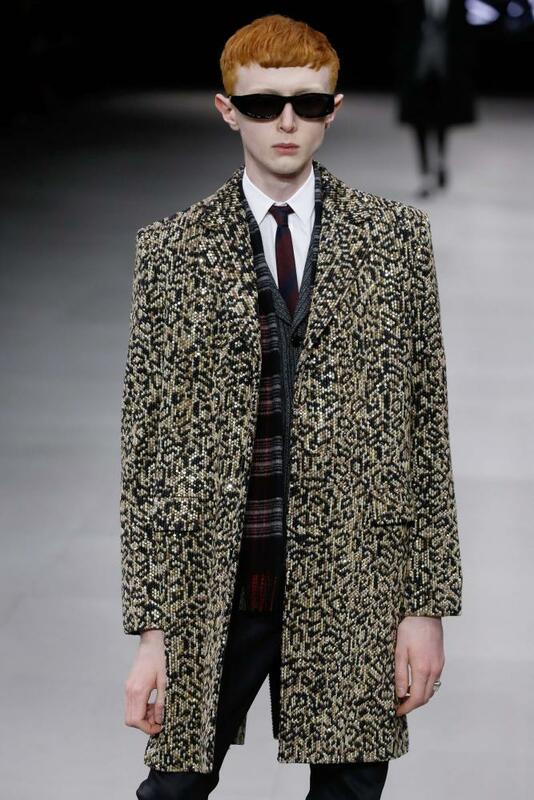 Harry Potter scarves at: Dunhill, Valentino, Liam Hodges and Sunnei.